I jumped on Sigma Beauty site during the holidays while I was ordering my mother a brush set and gifted myself (why not?). I am always cleaning my current foundation brushes and was in need of another eyeshadow brush. 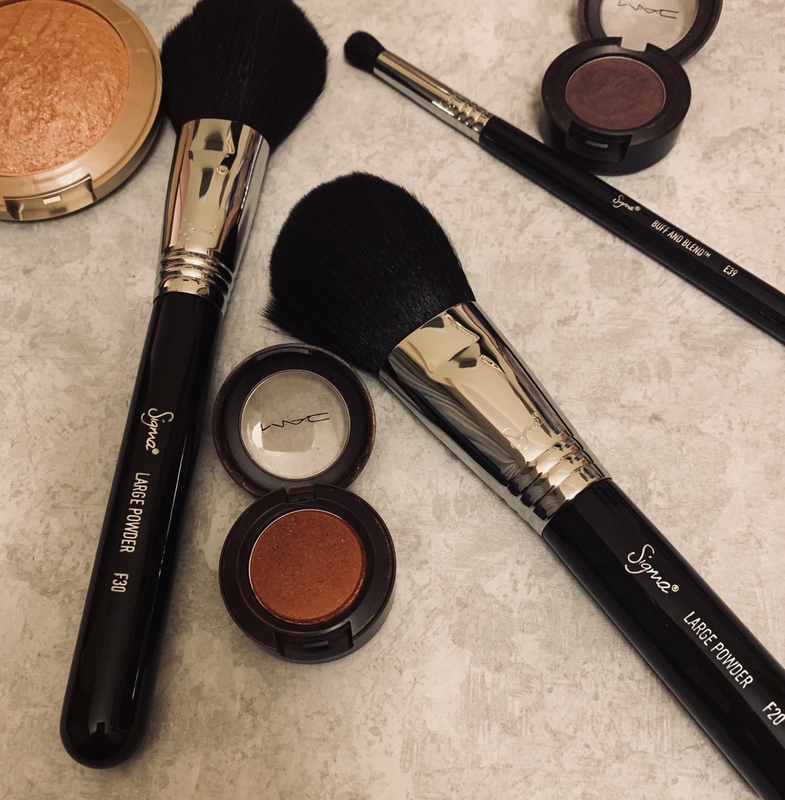 Sigma Beauty has been around since 2009 but it wasn’t until 2015 when I really started getting into makeup that I ordered my first set. After some research on the company, I learned I ordered the very first brush set they released. Sigma is also made up of a team of 90% women!!! Sigma brushes are made of antimicrobial synthetic fibers. This allows for brushed to not absorb product or oils from your face. Each brush is made with high-quality wood and 8 layers of primer and paint to ensure longevity. I wear powder foundation during the week to work so I ordered the F30 large powder brush. The soft bristles of the F30 brush evenly apply my powder foundations. The bristles are soft but grasp powdered products very well. I was not using a good bronzer brush and at times using my powder foundation which was too large for application of bronzer. So I turned to the F20 large powder brush. This is not a round brush but flat on top. I think it is good for bronzing cheekbones and temple area for better control of the product. The E39 buff and blend brush allow me to blend out smaller areas such as the corners of my eyelids. It is shorter and has a more dense brush head for better control of the product. I have used this brush for my crease colors and it buffs them out so flawlessly. I think this brush would create a great smokey eye and blend out shadows nicely under the lash line. Since I have become more focused and consistent on my skincare regimen I purchased the Skincare Brush Set. Each brush is labeled with the intended purpose so there is no confusion when applying your skincare products. The fibers and silicone of this brush set allow application of skincare products without your fingers and reduce tug and pull to your skin. It is also a better hygienic approach for your skin. You will have to wash these brushes after each use but it is really worth it when we are talking about our skin. It only takes me a few seconds to rinse them and I move on with the rest of my nightly routine. With the quality and design of these brushes, you will not be disappointed when you purchase Sigma Beauty brushes. If you have Sigma Beauty brushes what are some of your favorites?